Choose from a nice selection of beaded hoop earrings in different shapes and sizes which will complement any hairstyle, outfit or occasion. These earrings contain glass beads and seed beads. They hang approximately 2 3/8" from silve.. 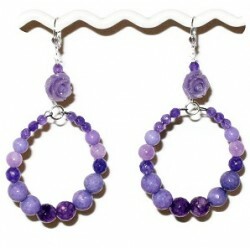 These earrings consist of seed beads and glass beads. It hangs approximately 2 1/2" from sil..